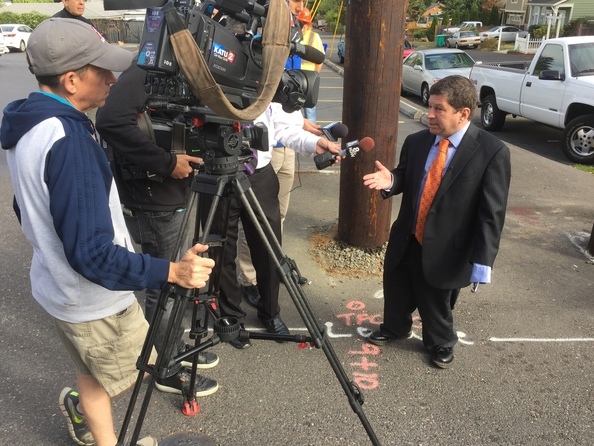 Transportation Commissioner Steve Novick speaks at the site of an upcoming sidewalk installation at a TriMet bus stop on NE Prescott. Photo by Portland Bureau of Transportation. (Sept. 15, 2016) Portland Transportation Commissioner Steve Novick, TriMet General Manager Neil McFarlane and Portland Transportation Director Leah Treat gathered today with community leaders to celebrate an agreement that will bring sidewalks, safer crossings and more transit service to East Portland. After hearing from East Portland community members that improved bus service was a top priority, Commissioner Steve Novick discussed the community’s needs with TriMet. Novick found that many of the sidewalk and crosswalk projects in the East Portland in Motion Plan would make it easier to get to transit and potentially improve bus ridership. The City Council approved Novick’s request for $3.1 million from the City’s General Fund to build sidewalks and crosswalk safety improvements. The improvements start this fall, with new sidewalks on NE Prescott Street. Improved bus service began Sept. 4, when TriMet created Line 73-122nd Ave. to increase rush hour frequency. "I heard repeatedly four years ago from residents of East Portland that improved bus service on 122nd was a priority. I first raised the issue with TriMet in February of 2012, and at that point they didn't see an immediate path to more frequent service. Subsequently, however, TriMet said that they could more easily justify service improvements if we were able to make safety improvements along the route to make it easier to access bus stops—the same kind of safety improvements that East Portlanders have been advocating for years. We have now committed more than $6 million to make those improvements, on last year's budget and through the Fix Our Streets measure—and TriMet is delivering on its promise. Today, we celebrate years of work and collaboration by TriMet, the City, and especially the people of East Portland." On Sept. 4, TriMet rolled out the first phase of service enhancements in this area, which included splitting Line 71-60th Ave/122nd Ave into two bus lines. The renamed 71-60th Ave line continues to run on the same frequency along 60th Avenue between Parkrose/Sumner Transit Center and Clackamas Town Center. The newly created line, named Line 73-122nd Ave, operates at increased rush hour frequency between Parkrose/Sumner Transit Center and SE 94th and Foster. The improvements are part of PBOT’s effort to achieve Vision Zero, the goal of eliminating fatalities and serious injuries from our streets. The approach includes changing street design so mistakes made while traveling do not result in deaths or serious injuries. It also includes education and enforcement efforts that have been shown to reduce fatalities. PBOT’s 122nd Avenue Area Safety Improvements project is investing $3.1 million in sidewalks and safer pedestrian crossings along a 6-mile corridor from NE Prescott Street to SE Foster Road, with construction from fall 2016 through fall 2017. Sidewalk improvements, new pedestrian islands and new rapid flash beacons are targeted at locations that will improve access to public transit and reduce the likelihood of fatal crashes. Learn more at the project web site. The Fixing Our Streets program will fund additional improvements in the area, with funds approved in May when voters passed Measure 26-173, the four-year, 10-cent Portland gas tax. Over the coming years, as capital investments are completed, TriMet will continue to roll out additional bus service enhancements until Frequent Service levels are reached on the Line 73-122nd Ave. Once complete, the Line 73 will join the MAX and the other 13 designated Frequent Service bus lines that offer 15-minute of better service intervals. TriMet’s Frequent Service lines—which carry roughly 58 percent of all bus trips—connect the regional hubs where many riders live and work. In addition to providing more frequency, these lines have a number of features designed to make trips easier, faster and more comfortable including new shelters and sign poles, ADA-compliant landings and curb ramps, bus stop re-spacing and curb extensions, and improved pedestrian access. PBOT includes 122nd Avenue among the city’s 10 High Crash Corridors. The rate of pedestrian crashes is about 50 percent higher than the citywide average. The average distance between pedestrian signals or median islands is more than a quarter mile, or about 1,400 feet.